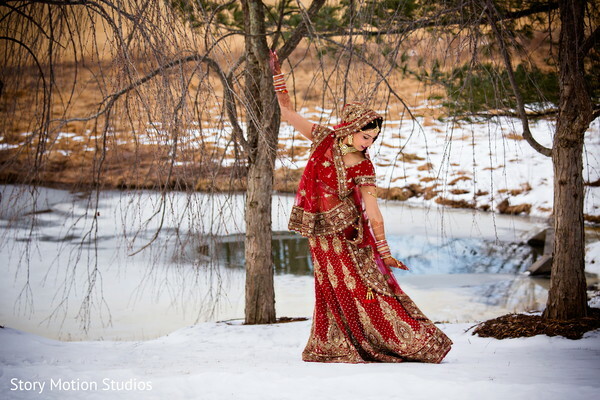 Ok, girls, I've seen some gorgeous Indian wedding & reception portraits but this Indian couple's gotta be one of my faves! 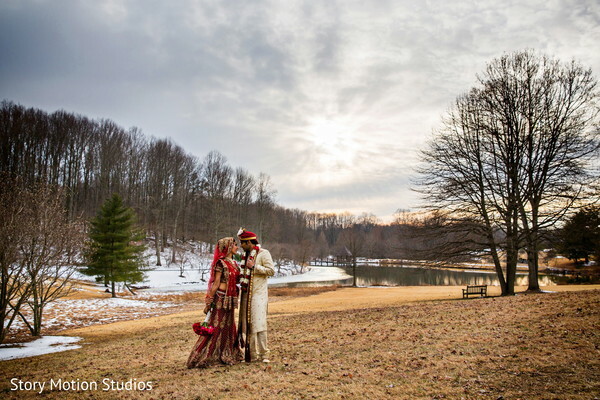 StoryMotion Studios takes breathtaking pictures of the lovebirds in snow-covered Virginia, which we also feature in our Emagazine! I hear an unexpected occurrence of ample snowfall took place a couple days before the ceremony hence serving as the perfect all-white backdrop for these pre-ceremony outdoor portraits. 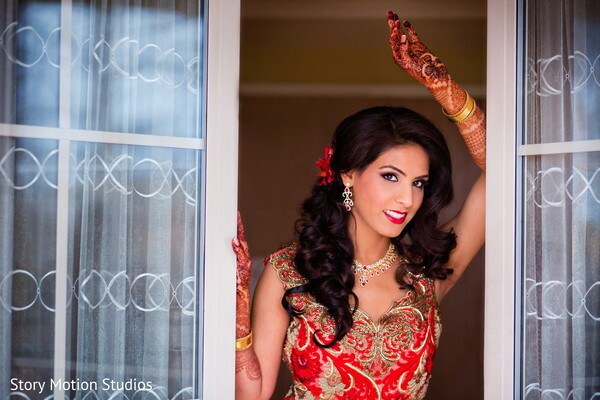 Maharani Sonia looks to good to be true with a glowing complexion and gorgeous cabernet lipstick, all thanks to the marvelous makeup stylings of Bridal Elegance by Suman Khosla! She looks like a real-life living doll that is flushed with a bronze-infused glow! 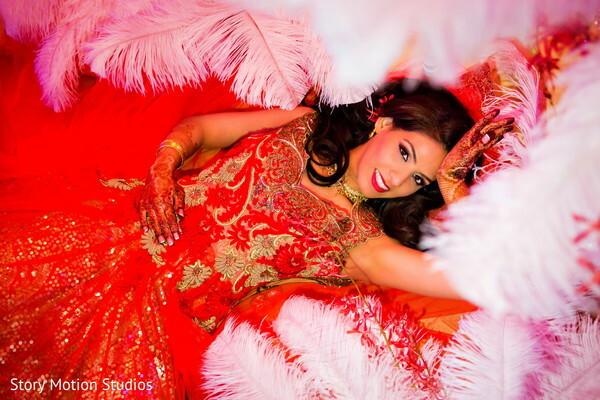 Bridal Elegance also provided the amazingly intricate mehndi design which stands out in every single image! Her Maharaja, Dave, looks quite dapper in his champagne-colored sherwani as he gazes at his bride-to-be with such adoration. 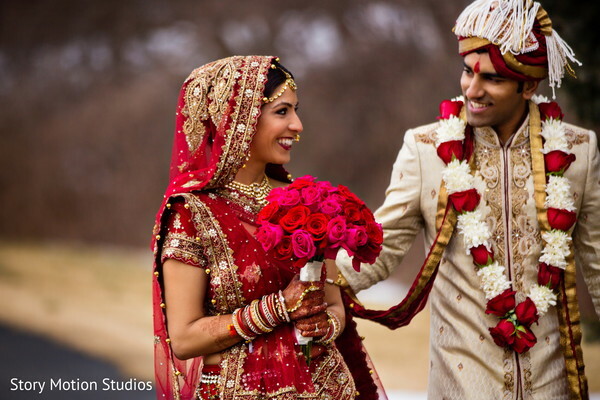 Then, feast your eyes on a completely different look the couple adorns for the reception! Sonia looks sensational with such an elegant side-swept hair-do and flawless makeup. 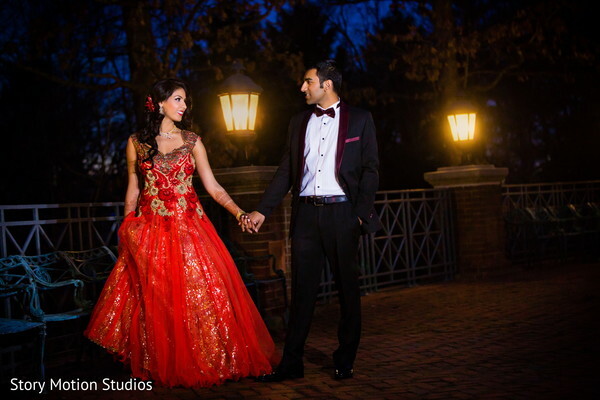 Her red-orange lengha enveloped in gold glitter is sublime! Her handsome hubby looks dashing in his black tux that is lined with a lovely burgundy lapel. What a striking couple! See more lovely portraits in the gallery! See their amazing wedding & reception on the Main blog! 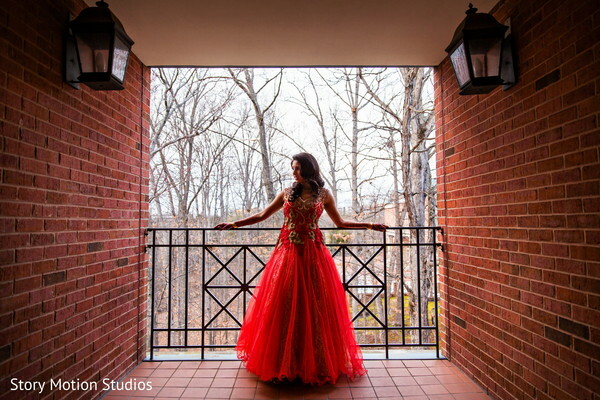 StoryMotion Studios, Dream Shaadi, Planet DJ Event Lighting, Planet DJ Productions, Bridal Elegance by Suman Khosla, Bollywood Bistro, Westfields Marriott Washington Dulles and Partyland Event Design Boutique are members of the Platinum Guide. Love what you see? Explore their portfolios.